When she was just three and a half years old, Kayleigh was diagnosed with neuroblastoma. It was a Thursday, and her mom Valerie Hale remembers every single moment of it. When Kayleigh was first admitted on August 4, 2009, there weren’t any available rooms on the hospital’s oncology floor, so she was admitted to the cardiology floor. It wasn’t until the next day that she finally got a room on the oncology floor. 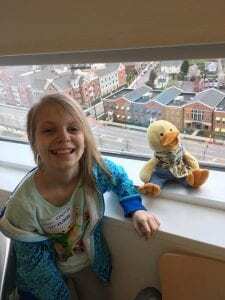 As soon as she got into her room, there was a Chemo Duck waiting on the bed for her. While Kayleigh found comfort in her Chemo Duck, Valerie found comfort in her family and other families within the childhood cancer community. Today, Kayleigh is almost nine years cancer-free. This November, she will be eight years out of treatment. She still has her original Chemo Duck from nine years ago, as well as a newer duck and a Chemo duckling. Kayleigh has a lot of lasting effects from chemo, radiation and other treatments. She lost a good bit of her hearing and now has a hearing aid on one side and a cochlear implant/hearing aid hybrid on the other. She has also had problems growing and gaining weight. However, despite her struggles at such a young age, Kayleigh takes it all in stride and very rarely complains. She is doing well in school — all A’s and B’s! — and is friends with everyone in her grade. In fact, Kayleigh is a very spunky girl. She’s bright and can put a smile on anyone’s face. An artist at heart, Kayleigh loves art, music (more specifically: Twenty-One Pilots) and animals. She has a bearded dragon named Zilla and a chihuahua named Sammy. Known for her big heart, Kayleigh truly cares about people. 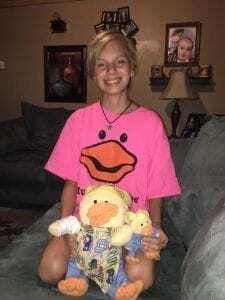 Everyone with Gabe’s Chemo Duck Program is so glad to hear that Kayleigh is doing well and that her Chemo Duck is still by her side every step of the way. We cannot wait to see where Kayleigh’s loving, artistic spirit will take her next. The sky is the limit for this sweet, spunky girl! This entry was posted in Chemo Duck, Newsletter and tagged Chemo Duck, Childhood Cancer. Bookmark the permalink.